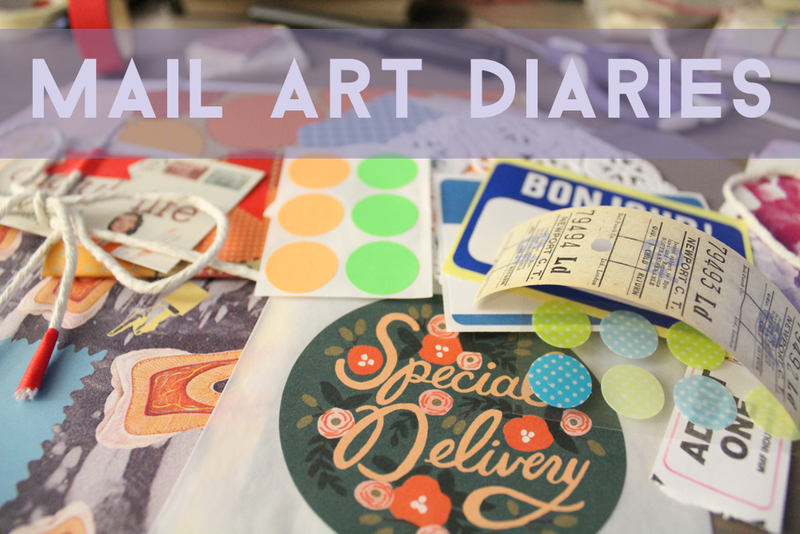 There are so many ways that you can organize your mail art supplies. I have so many illustrations, stickers, papers, etc. I’ve always struggled with finding a great way to organize everything, especially in a way that would make me use it often. For a long time, I collected books that I could cut up and use in collages. I would keep buying them from thrift stores and store them out of sight. Occasionally pulling them out, when I would remember, and sort through them to find the perfect image. That got old! I wanted to have more space and get rid of the actual books I had. One day, I pulled all of my books out and went through them, one-by-one, page-by-page. I ripped out each page and cut out the bits that I thought I would use someday. I recycled the rest. Of course, this took me waaaaay longer than a day but I got it done. After I had everything I wanted to keep, I had to figure out a way to sort it all. I had a little filing cabinet that I picked up from the thrift store that I thought would work perfectly. I sorted through all the pages and images, coming up with different categories. I created a little file folder for each category and stuffed them into the cabinet. This system is especially nice because I can simply pull out the folder of the images I want to sort through! In addition to my filing cabinet, I have two little IKEA boxes. One for embellishments and another for paper scraps. In my embellishment box, I keep basically everything. All of my stickers, tags, journaling cards, mailing labels, doilies, alphabet stickers, die cuts, you name it! The paper scrap box is for all the little pieces of paper that are left over when I cut up big pieces of paper. I try to use these up as much as possible. How do you store your supplies? Oh, mail art. In addition to sending lovely things in the post, you can spruce up your mail in so many different ways! I’ve been involved in mail art for, like, 10 years now at least. When I was a youngin’, I would simply try to copy the style of what was sent to me. Different shapes of paper, collages, stickers, doodles, you name it. It took a little time to find my own personal style! I incorporate so many different things in my mail but one thing that has been consistent over the years has been collage. Even before decorating envelopes, I loved making (terrible) collages, mostly in my journals. This evolved to collaging envelopes once I found out that you could actually do that! Needless to say, I’ve figured out some essentials in collaging from my journey. If you’re just getting started, or even just curious what supplies I use, check out the barebone list below. ► Paper bits – First and foremost! You can’t make a collage without something to paste down. Use anything and everything you can glue down. ► Adhesive – I prefer plain, school glue sticks because they are easy to store and use. 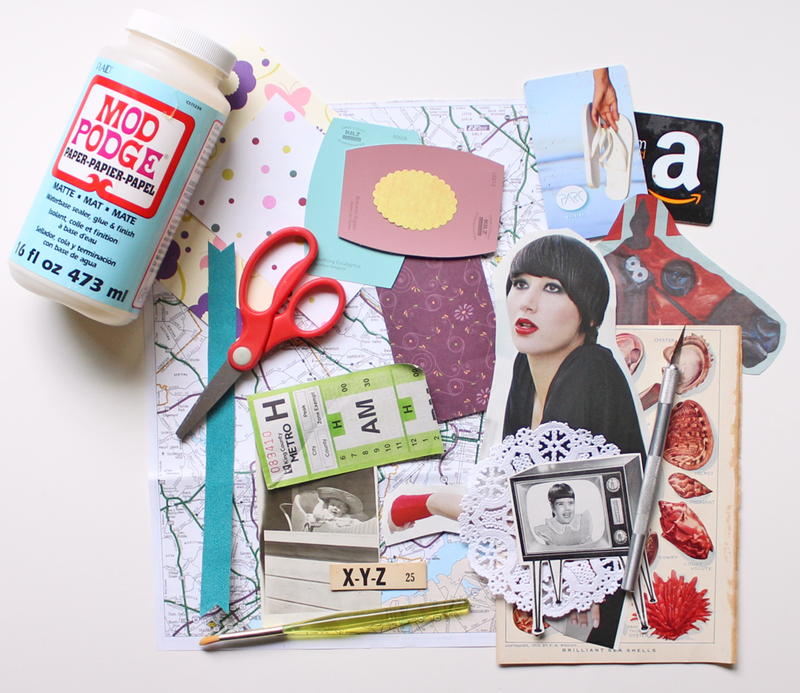 Mod Podge is great for covering large areas as well as reinforcing your completed collage. Some other handy adhesives are double-sided tape and glue runners. They all have their time and place! I’ve recently found out about a thing called a glue pen and, while I haven’t tried one yet, it sounds PERFECT. ► (optional) Paint brush – If you’re applying Mod Podge or other liquid-y glues, these will come in handy! ► Scissors or X-ACTO Knife – I’ve always, always preferred scissors over and X-ACTO Knife but the knife do comes in handy on occasion. I usually end up ripping papers to bits with the knife though. Probably just me. ► Old cards – These are one of my favorite tools. They are so useful when you need to smooth down something you just glued. In general, they do all the work and keep your hands clean! Short list, huh? Just a few of the absolute essentials. 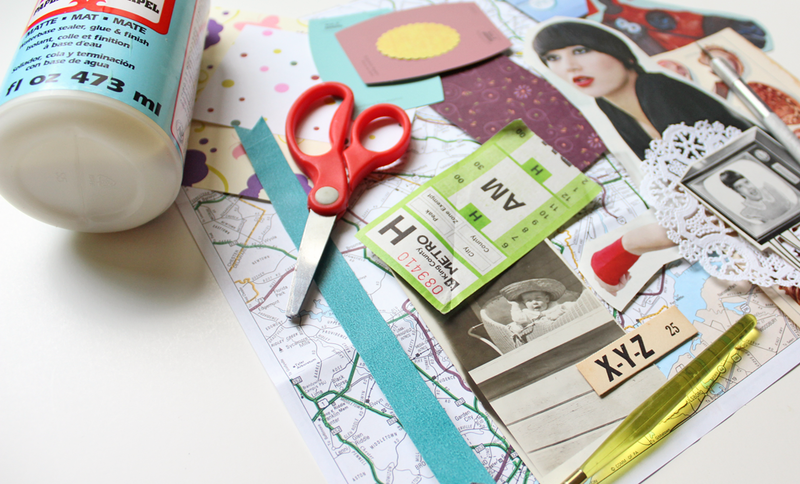 I could do a whole post on paper bits (and I probably will) but all you really need to get started is glue, scissors, and ephemera. What do you guys use when making collages?